That’s right. 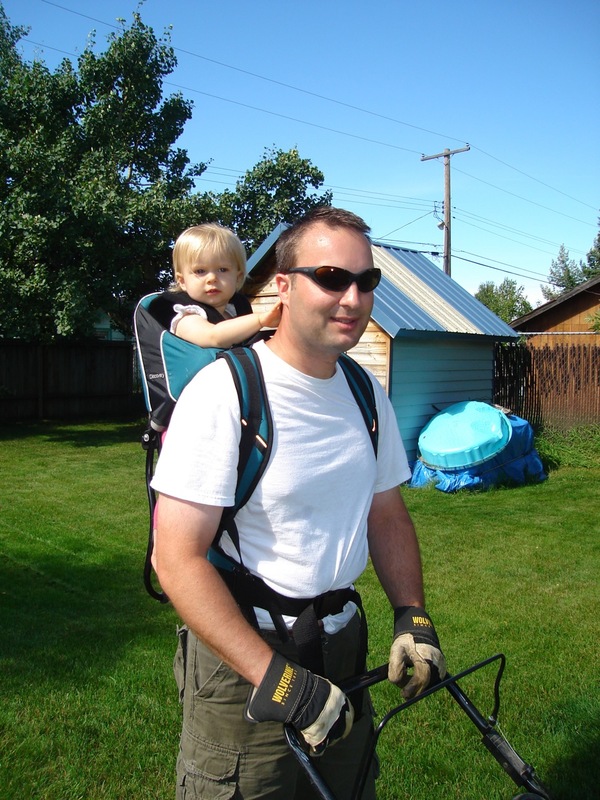 He’s mowing the lawn with my daughter on his back. What a guy. We celebrated our fifth wedding anniversary last night. 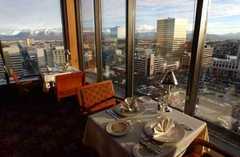 We went to the Crow’s Nest, which is a restaurant on top of one of the tallest buildings in the city. The views of the mountains and city were beautiful. We ate ourselves into a coma. Rock on. My husband got me the best present an Alaskan could ask for: an autostart for my car. I already have one, but it doesn’t work well (read: it’s been a nightmare since Day 1), so I’m totally psyched to get an upgrade. He sure does know me well. I got him theatre tickets. Yeah, I know, not most husbands’ idea of a great anniversary present, but just wait: they are for Spamalot and JC Superstar. He’s a big Monty Python fan and the latter is one of his favorite movies. Oh, and the ticket pack also comes with tickets to Annie. Meh. I might sell ’em. Anyway, I’m jazzed.